Chemical Steel shares have fallen a whopping 30% and could fall further due to an increasingly common pest problem: witches. A witch infestation can be a damning curse for any company. They present a physical hazard, knocking over apparatus and people with their brooms, swooping about the place and snagging loose clothing in delicate machinery. Additionally, they often use occult and magical techniques to purposefully sabotage a company’s showing on the stock markets, with negative spell-casting adversely affecting share prices. Research has shown that once a colony of witches reaches a certain population density they are almost impossible to exterminate. It is likely that witches were directly responsible for the famous Wall Street Crash of 1929 as they moved into factory and office buildings, gradually forcing staff out onto the streets by whatever exits they could find – even upper-storey windows. There have been many scientific advances in witch control since then, and modern techniques have much improved. Infestation levels in 1990 had reached their lowest levels since records began in the late 17th century: only one UK company reported witch infestation at all, and that at a tolerable level. 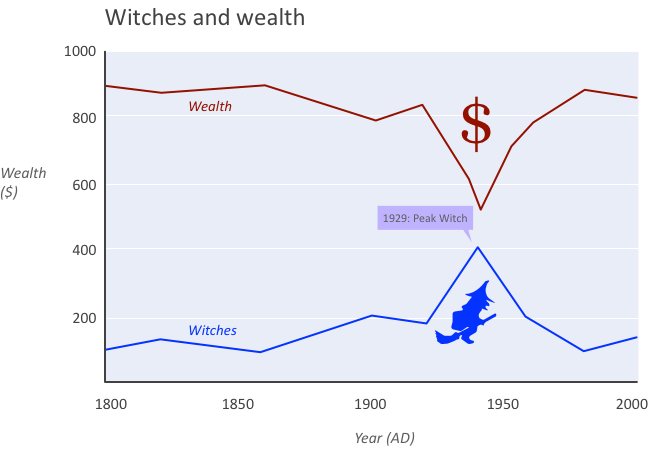 However, as witches became a rare sight in our cities, so witch control became a less profitable business. A once thriving industry was reduced to a few ailing family firms in a matter of months. As those trained in witch control techniques grow old and die, their valuable knowledge is lost forever. This entry was posted in Equities and tagged recession, witches. Bookmark the permalink.